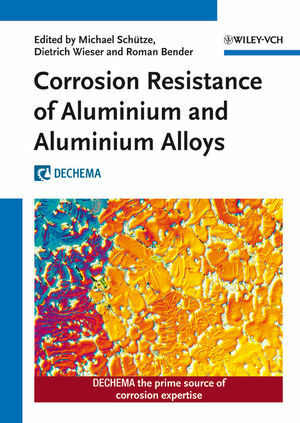 Bringing together the widespread information on the topic, this handbook and ready reference is clearly structured according to the various media that can corrode and damage aluminium and aluminium compounds, while also discussing methods of prevention. With its coverage of multi-talented compounds and energy-saving materials, this is a must-have for all those working in the relevant industries. Michael Schütze, born 1952, studied materials sciences at the University of Erlangen-Nürnberg from 1972 to 1978, then joined the Karl Winnacker Institute of the DECHEMA as a research associate. He received his doctorate in engineering sciences from the RWTH (Technical University) in Aachen in 1983, completed his habilitation in 1991, becoming a member of the external teaching staff of the RWTH. Since 1998, he holds a professorship there. In 1996, he was appointed director of the Karl Winnacker Institute. He is recipient of the Friedrich-Wilhelm-Prize, the Rahmel-Schwenk medal and the Cavallaro medal, past Chairman of the Gordon Research Conference on Corrosion, editor of the journal Materials and Corrosion, Past - President of the European Federation of Corrosion, Past-President of the World Corrosion Organization and Chairman of the Working Party Corrosion by Hot Gases and Combustion Products of the European Federation of Corrosion. Dietrich Wieser, born 1957, studied nonferrous metallurgy at the University of Leoben and joined the Research & Development Center of VAWaluminium AG (VAW) in Bonn in 1985. He received his doctorate in engineering sciences from the Technical University of Clausthal in 1992. At VAW and Norsk Hydro ASA he has been responsible for the corrosion laboratory. Topics were: corrosion behavior, corrosion testing and corrosion protection of aluminium and aluminium materials. Since 2005 he is with Alcoa, currently in the position of a Director Business Development for Ground Transportation in Europe. He is member of the advisory board of the journal Materials Science and Engineering Technology and chairman of the working group Corrosion and Corrosion Protection of Aluminium and Magnesium in the GfKORR (Gesellschaft für Korrosionsschutz e.V.) and its sub-groups Galvanic Corrosion and Corrosion Testing/Corrosion Investigations for Magnesium Materials. Roman Bender, born 1971, studied chemistry at the Justus Liebig Universtity of Gießen from 1992 to 1997. After he received his diploma he joined the Karl Winnacker Institute of the DECHEMA in Frankfurt (Main) as a research associate. Since 2000 he is head of the group materials and corrosion at the DECHEMA and editor in chief of the worlds largest corrosion data collection the DECHEMA Werkstofftabelle and the Corrosion Handbook. In 2001 he received his doctorate in natural sciences from the Technical University of Aachen (RWTH Aachen). He became chief executive officer of the GfKORR in Frankfurt (Main) - The Society for Corrosion Protection - in 2008.